Thursday 24 August is National Burger Day, so we’ve rounded up the finest, juiciest offerings available in London. There are so many factors to consider when it comes to the ultimate burger – quantity, quality, sauce, bun and sides are all as important as the patty itself. So sit back, take your time and allow the idea of each burger to sit with you a little while as you decide where to celebrate today’s auspicious occasion. MEATLiquor’s Dead Hippie burger is an iconic name on the burger scene and edible proof that good things can come in small packages. Neatly packaged in a glisteningly smooth bun, the double whammy of two mustard-fried beef patties hits you right in the sweet spot, before their secret dead hippie sauce finishes you off. MEATLiquor can be found throughout London, with outlets in Brixton, Canary Wharf, Covent Garden, East Dulwich, Hoxton, Islington, Marylebone and Queensway. Bringing the taste of New York to the big smoke, the Bleeker Street bacon cheeseburger is heaven in a convenient little box. Famed as one of the best burgers in London, the melt-in-your mouth, juicy patties definitely live up to their reputation. Best teamed with a black and white shake and a portion of “angry fries” – which come generously doused in a mix of hot sauce and blue cheese. Bleecker can be found throughout London, with outlets in Bloomberg, Southbank Spitalfields and Victoria. It’s clear from the first bite that Red’s True BBQ are the messiahs of meat. 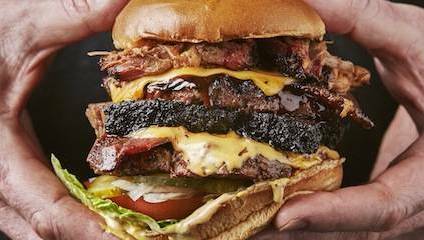 With two juicy beef patties, generous amounts of Black Angus brisket, crisp bacon, mounds of perfectly slow-cooked pulled pork, a layer of oozing cheese and all the usual suspects that make a great burger (hello pickles! ), the Pit Burger is a delicious monster of a meal. If that wasn’t enough, it even has a giant crispy onion ring atop its bun; a golden battered crown to celebrate its might and glory in the realm of London’s burger royalty. Red’s True BBQ can be found at 54-56 Green Eastern Street, Shoreditch, EC2A 3QR. Good Life Diner can be found throughout London, with outlets in Camden, Covent Garden, Dalston, Gloucester Road, Islington, Shoreditch, Soho, Spitalfields and The Strand. Good Life Diner's Diablo burger. Image courtesy of HamBurger Me! It’s the 21st century, so burgers don’t have to include animals any more (Webster’s defines a burger as a flat round cake made of a “specified ingredient”, typically served in a bun) meaning Honest Burger’s vegetable fritter fully qualifies and deserves its place on this list. Almost pakora-like in style, the cauliflower, sweetcorn, tomato and shallot fritter is seasoned with coriander and comes with a fabulously fresh raita sauce. The accompanying rosemary-salted chips are the finest side in town to boot. Honest Burger can be found throughout London with outlets in Baker St., Bank, Borough, Brixton, Chiswick, Clapham, Covent Garden, Dalston, Greenwich, Hammersmith, Kings Cross, Liverpool St., Old St., Oxford Circus, Peckham, Portobello, Soho, South Kensington, Tooting and Warren St.